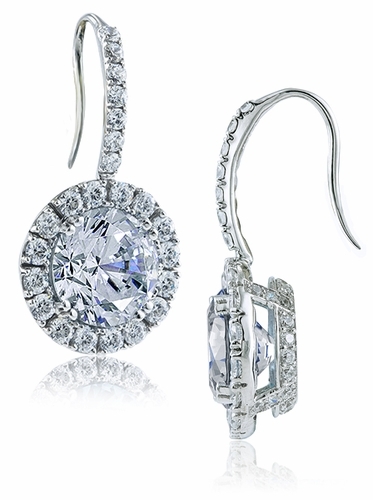 The Dosier 4 Carat Round Cubic Zirconia Halo Shepherd Hook Drop Earrings feature a brilliant 11mm 58 faceted round diamond look cubic zirconia in each earring for a total of 8 carats for the pair. A halo of prong set cubic zirconia rounds further enhance the beauty and sparkle of the center stone and line the top of the drop as well. They come standard with shepherd hook backs, also referred to as kidney wire or French wire backs. The finest hand cut and hand polished original Russian formula cubic zirconia offer you the look you want at a fantastic savings. 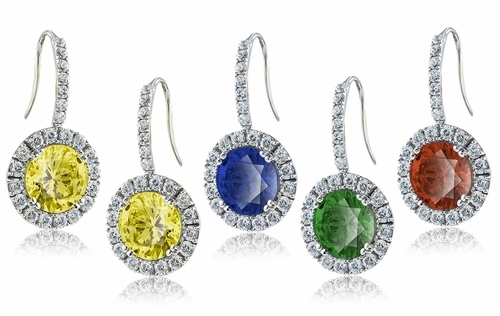 The brilliant center stone is available in various color options that include man made ruby red, sapphire blue or emerald green gemstones in addition to lab created canary diamond look yellow, pink diamond look or white diamond look cubic zirconia. Choose from 14k white gold or 14k yellow gold in the pull down menu and 14k rose gold, 18k white gold, 18k yellow gold and platinum are available via special order. 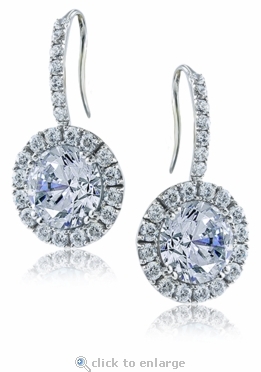 These drop earrings are also available in different carat sizes and diamond shapes. Please call us directly for a quote. 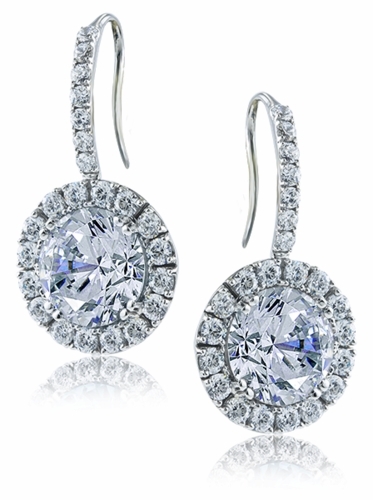 You may also be interested in item E1339 that features cushion cut stones. For further assistance, please contact us directly at 1-866-942-6663 or visit us via live chat and speak with a knowledgeable representative.